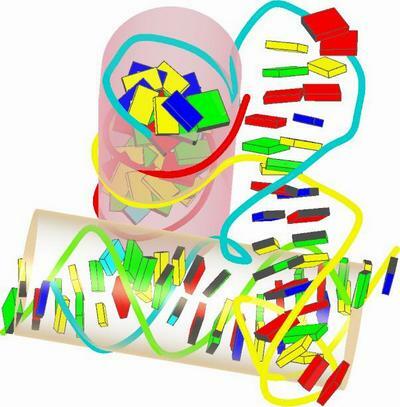 3DNA is a versatile package for the analysis, rebuilding, and visualization of three-dimensional nucleic acid structures, based on a standard reference frame (Olson et al., J. Mol. Biol. 313(1), 229-237, 2001). In its core, the software uses a simple, yet mathematically rigorous and geometrically sensible, scheme for calculating a complete set of local base-pair, step, and helical parameters, and allows for exact rebuilding of a structure based on these parameters. Unique features of 3DNA include automatic classification of a dinucleotide step as A-, B-, or TA-like based on the positioning of the phosphorus atoms, and the generation of "standardized" base stacking diagrams. The rebuilding routines give Calladine-Drew style schematic representations of DNA as well as full atomic models with the sugar-phosphate backbone.